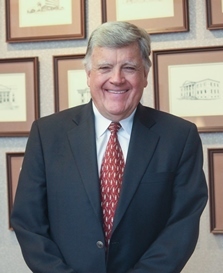 Bruce Alverson has been a Nevadan since 1951 and concentrates his practice on all aspects of civil trial work. Bruce graduated from the University of Nevada’s College of Business with a major in accounting. He began work in a Las Vegas accounting firm and received his Certified Public Accountant designation. Thereafter, Bruce worked for the international accounting firm of Peat, Marwick & Mitchell, the predecessor of KPMG, in San Francisco where he performed certified audits of major companies and later worked in the firm’s tax department. He also attended law school at night. After a short stint as an auditor with the newly created railroad entity Amtrak, he returned to Las Vegas to commence the practice of law. In 1977, Nevada’s former United States Senator Harry Reid and Bruce formed our present law firm which has grown from two lawyers to one of the largest, and oldest, in Nevada. Always a historian at heart, Bruce began taking history classes at the University of Nevada, Las Vegas and ultimately obtained his PhD in history. He has written extensively in the areas of legal history, Nevada history, and the law. He is a member of the four most prestigious trial lawyer organizations in America. Membership in each of these organizations is by invitation only, and trial lawyers are invited to become members only after an extremely thorough screening process which includes references from judges and other practicing trial lawyers. These organizations are the International Academy of Trial Lawyers (membership is generally limited to 500 U.S. trial lawyers), the American College of Trial Lawyers (membership limited to 1% of the State Bar members), Diplomate ranking, American Board of Trial Advocates (ranking limited to those lawyers who have 100 or more civil jury verdicts), and the International Society of Barristers. Bruce is the only Nevada trial lawyer who is a member of all four of these organizations, and he holds leadership positions in each of them. Bruce has an “AV Preeminent” rating with Martindale Hubbell, and is listed in Mountain States Super Lawyers and Business Edition Super Lawyers in the area of Civil Litigation Defense. Kodera v. United Rentals: A 47 year old off-duty California Highway Patrol Officer wrecked her motorcycle in or near a road construction site in Las Vegas. She claimed that the traffic control plan and devises were improper which caused her to be confused as to which direction she should be driving. As a result, she locked up her brakes, went into an uncontrollable skid and crashed. She sustained moderate to severe brain damage, suffered numerous fractures and lacerations, and was in a coma for weeks. She will never work again and at issue was whether she could live alone, with moderate supervision, or whether she needed an assisted living arrangement. She incurred past medical bills of nearly $700,000; future life care expenses of nearly $900,000; and loss of income of nearly $930,000. The jury returned a defense verdict based upon proximate cause after a ten-day trial. Robeck v. Lunas Construction: The Plaintiff, a middle aged banker, was rear ended by a tractor-trailer. The parties stipulated to liability. The Plaintiff underwent fusion surgery at two levels in his low back and incurred nearly $230,000 in past medical expenses, and between $1.4 and $1.8 million for past and future loss of income. After a four-day trail, the jury returned a defense verdict on the issue of proximate cause. Triplett v. Oakland: A 34-year-old female security guard was rear ended while stopped at a “yield” sign on a freeway exit. She claimed an injury to her cervical spine, which required five surgeries including multi-level fusions, and future treatment included a spine stimulator. She claimed damages of $750,000 past medical expenses, $6,000,000 future medical expenses, and loss of income until age 65. Plaintiff made a settlement demand of $13,000,000. An eight-day jury trial resulted in a verdict of $1,237,862. Fields v. Fleetwood Enterprises Inc.: Plaintiff father was operating a Fleetwood motor home. His six-year-old daughter was a passenger. A fire occurred in the engine compartment and both occupants sustained significant burn injuries. Plaintiffs alleged that the vehicle was negligently designed. Plaintiff father sustained $283,200 and $53,800 in past and future medical expenses, and his daughter sustained $413,600 and $183,000 for past and future medical expenses. Both had extensive scarring. Plaintiffs demanded $837,000 for the father and $11.4 million for the daughter. A defense verdict after a five day jury trial. Aspgren v. Zurich Insurance Company: A 48 year old financial planner was rear ended. He was earning $250,000 per year. Plaintiff allegedly sustained a closed-head injury, cervical injuries resulting in double vision, migraine headaches, cognitive deficiency, and a residual fibromyalgia and myofacial pain. Plaintiff alleged $70,000 and $150,000 for past and future medical expenses, $400,000 and $2.5 million for past and future loss of income. He made a pre-trial demand of $7.2 million. After an 11 day trial, the jury awarded Plaintiff $300,000 (reduced to $165,000 due to offsets), and found for Defendant on the issue of bad faith. Sherba v. McLane/Sunwest Inc.: A 90 year old pedestrian was killed when Defendant’s 18-wheel tractor trailer ran over him. Plaintiff claimed that the driver was looking for eastbound traffic prior to pulling onto the street. Decedent was going westbound on the sidewalk, walked in front of the tractor-trailer and was run over. Evidence of contact included tire track marks on the decedent’s clothing. Plaintiff demanded $2 million for settlement and after a nine-day trial, the jury found for the Defendant. McCrea v. Stovall: Defendant lawyer represented the Plaintiff in a dental malpractice action that was dismissed for failure to bring the case to trial within five years. The Plaintiff sued her lawyer for malpractice. The trial focused on the value of the underlying dental malpractice case in determining what, if any, damages resulted from the dismissal. After a five-day jury trial, defense verdict. Aceto v. Shreck and St. Paul Insurance: Plaintiff was rear ended by Defendant Shreck in a multiple vehicle accident. Plaintiff claimed torn cartilage of the knee, torn rotator cuff, bilateral carpel tunnel syndrome, and soft tissue injuries extending from the cervical through the lumbar spine. Plaintiff sought $75,000 in medical expenses, $273,000 in lost income, and argued damages of $1.4 million to the jury. After a five-day trial, defense verdict. Hole v. Drs. Sobel and Klein: A female Plaintiff, age 61, had a long history of angina, high blood pressure, and congenital narrowing of the aorta, for which she underwent heart surgery. Plaintiff alleged that the doctors failed to recognize signs of impending closure of the carotid artery after the surgery and she subsequently had a debilitating stroke. After a 4½-week jury trial, defense verdict. Beader v. Dr. Chin: A 60 year old woman sought chiropractic treatment from Defendant for neck pain. Although she denied having complained of lumbar pain, the Defendant chiropractor adjusted her low back and allegedly caused herniation of a lumbar disc. After a six-day trial, the jury returned a defense verdict. Hinds v. Drs. Kantor and Perer: After being hospitalized for hepatitis B, Plaintiff alleged the Defendant doctors, nephrologist and gastroenterologist, failed to make the correct diagnosis of vasculitis and polyarteritis, for which she was later hospitalized four times over an eighteen-month period. The delay in diagnosis, she argued, caused irreparable damage and left her permanently disabled from full time employment. After a two-week jury trial, defense verdict. Perogoy v. North Las Vegas Cab Company: Female Plaintiff, age 50, was a passenger in a vehicle which was rear ended by Defendant cab driver. Liability was not contested. Plaintiff alleged cervical and lumbar injury that resulted in a laminectomy, a rib resection for thoracic outlet syndrome, and a non-diagnosable disease of the arm–all of which disabled her from work. Plaintiff claimed past medical expenses of $100,000, future medical expenses of an undetermined amount, and loss of income of $225,000. After a nine-day trial, the jury awarded $12,300. Saulog v. Dr. Silver: During a cesarean section delivery, the operating room nurses notified the surgeon that a laparotomy sponge was missing. After a thorough search, including x-rays, the surgeon determined that the sponge was not inside the patient and closed the procedure. Later, the Plaintiff felt a lump in her abdomen and two years later the sponge was identified and surgically removed. Defendant argued that he followed the generally accepted procedures for identifying whether a missing sponge was within the body cavity of a patient, and that closure of the incision could not wait indefinitely. For unexplained reasons, the x-ray did not identify the presence of the sponge in the Plaintiff. A jury instruction regarding the presumption of negligence due to a foreign object left within the body of a patient was given. After an eight day trial, the jury returned a defense verdict. Fluxgold v. United Blood Services: Decedent underwent a successful heart surgery and the day before he was discharged he was given a blood transfusion to “pink up” his appearance. The blood, which was provided by United Blood Services, was contaminated. Plaintiff died the next day. Defendant argued that blood is a product that cannot be made 100% contamination free, and that the blood center followed the proper procedures in drawing and storing the blood. After an eight-day jury trial, defense verdict. Blackstone v. Las Vegas Fertilizer: An elderly driver hit a pedestrian while in a cross-walk, knocking him ten feet into the air. He landed on his head. Plaintiff was in a coma for ten days, and sustained a residual closed-head injury that resulted in memory loss, depression and loss of income. After a week long trial, the jury returned a defense verdict based upon comparative negligence. MGM Hotel Fire Litigation: Served as a member of the Plaintiffs’ Legal Committee, representing the subrogation interests of several major insurance companies.